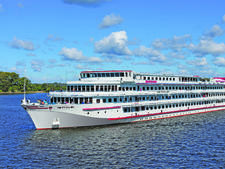 Part of a Russian class of 22 nearly identical river cruise vessels constructed between 1974 and 1983, Kronshtadt was given a through refit by Vodohod in 2018 that resulted in more modern and updated interiors and increased passenger comforts in staterooms and suites. Kronshtadt distinguishes itself with its spacious and airy public rooms, along with a plethora of accommodation options. 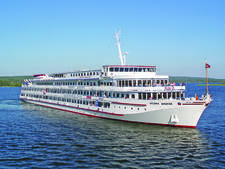 These include an unusually large number of staterooms available for solo travelers, as well as cabin options that can accommodate up to four people. 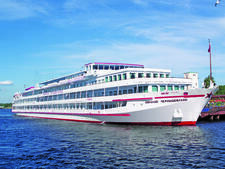 Sailing the Volga River between St. Petersburg and Moscow, Kronshtadt offers 11- and 12-day cruises that call on ports like Uglich, Yaroslavl, Goritsy, Kizhi and Mandrogui. Meals are served in the main restaurant on Middle Deck. The room, located all the way at the back of the ship, features oversized picture windows that attractively wrap around and offer 180-degree views of the passing scenery. Breakfast, lunch and dinner are served here. 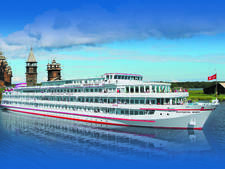 Breakfasts and lunches onboard are served buffet-style, and come with complimentary water, coffee or tea. Dinners are menu-driven affairs, with a set starter, choice of one of three entrees and a choice of two desserts -- typically, a daily specialty or a fruit plate. Selections for the following day are made the night before. 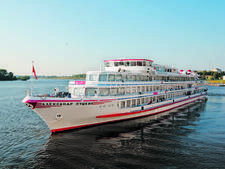 Unlike other river cruise lines that include free-flowing wines with lunch and dinner, only one glass of wine is offered each evening at dinner. Additional glasses of wine can be purchased at prevailing bar prices. A glass of juice is also free at dinner for those who don't partake in wine. Dinners in Moscow and St. Petersburg are set menus with no alternates. A coffee station is provided onboard and is open from 6 a.m. until breakfast, 10 a.m. until noon, 4 until 6 p.m. and from 9 until 11 p.m. The coffee station includes caffeinated and decaf coffee, hot water for tea, cocoa, sweetener and cookies. One bottle of still water (330ml, or 11.1 fl. oz.) is provided daily in each cabin. Cabins aboard Kronshtadt were all refitted in 2018 and now feature new soft furnishings, wall treatments and upgraded cabinetry. Most are small but functional, if slightly on the spartan side (an adjective that definitely applies to the white, hospital-esque cabin corridors). 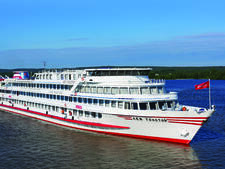 Unlike almost all other cruise lines, Vodohod assigns cabin numbers seven days prior to the cruise departure. Passengers wishing to secure an assigned room before this will have to pay 50 euros per person at the time of booking. All cabins have river views, though it is worth noting that the Triple Cabins on Lower Deck feature porthole windows that do not open. 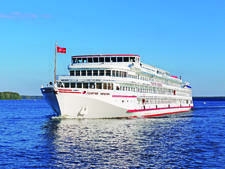 A full 20 cabins aboard Kronshtadt have been set aside for solo travelers. These feature picture windows, a single bed, flat-panel television and in-room bathroom. Unlike the rest of the accommodations onboard, these single cabins do not feature a stand-up shower that is separate from the rest of the bathroom -- meaning everything from the toilet to the sink will get wet when you perform your daily ablutions. In addition to 40 deluxe cabins that offer more personal space (and full showers), a total of six suites are offered onboard. Each suite features separate living and sleeping areas, four large windows that open, new decor and partially updated lighting. The uppermost deck of Kronshtadt features an outdoor solarium and plenty of space for admiring the scenery during port stays or scenic cruising. A long, banquet-style conference center is located on the forward end of this deck. There is no passenger elevator aboard Kronshtadt. 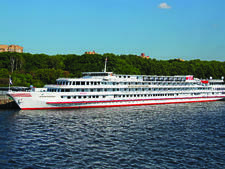 Onboard entertainment is varied, and typically includes lessons in Russian language and songs, live musical concerts, dancing in bars offered nightly and a tour of the ship's bridge when conditions permit. There are no dedicated facilities for children or teens onboard Kronshtadt, and the ship's itinerary typically caters to older, more adventurously traveled adults. 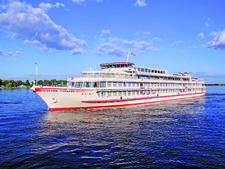 Kronshtadt operates 11- and 12-night sailings from Moscow to St. Petersburg, along Russia's Volga River.